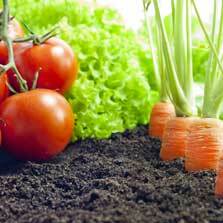 Learn how to grow organic food in a sustainable and environmentally-friendly manner. Growing your own organic food in an environmentally friendly and sustainable manner is becoming a very popular activity. However, many people hesitate at growing vegetables as they are uncertain how they should start and of the kind of work that is needed. This organic food course will introduce you to all aspects of growing garden vegetables in an organic and sustainable manner. The course will give you a thorough knowledge and understanding of how to grow a large variety of vegetables such as carrots, cabbage, lettuce, tomatoes, potatoes, leeks and many others. You will also learn about maintaining your garden vegetable plot, how to test and improve soil, make compost, create a raised bed, sow seeds and implement crop rotation. This organic food course will be of great interest to all learners who would like to grow their own food in an organic and sustainable manner but would like to follow the advice and guidance of organic experts. Upon completion of this course you will be able to: - Grow vegetables from a large variety of family types; - Maintain a vegetable plot; - Test and improve soil; - and make compost.